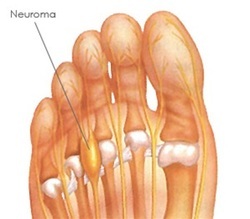 Morton's neuroma is enlargement and inflammation of the digital nerves under the ball of the foot. It commonly occurs between the third and fourth toes because, unlike between the other toes, two nerves pass between the metatarsal bones. This makes the nerves more susceptible to become compressed ("pinched"). Someone who has a Morton's neuroma may feel numbness, burning or a sharp sensation in the affected area and into the toes. A Chiropodist can assess the structure and function of the feet, determine the cause of the nerve compression, recommend footwear, modify existing shoes, prescribe custom foot orthotics and make custom digital appliances.